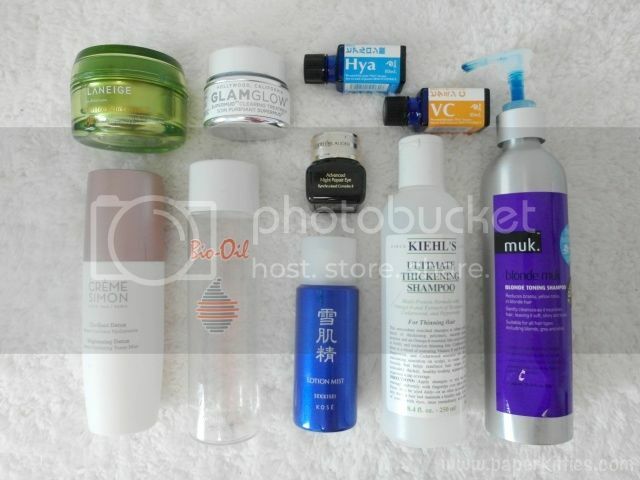 Starting from the top left corner, we’ll start the beauty empties review with Laneige! Previously reviewed , I’ve finally finished using Laneige Trouble Relief Cream! As I find it slightly too rich for my liking, I tend to only use this at night and only when my skin is breaking out. Amongst all the acne care products I own, I find this most gentle to be used – especially on days after my extractions and laser treatments, yet still feel assured that it is doing its job in reducing inflammation. I personally won’t recommend it for you to treat your acne problems, but more for after-acne treatments to keep bacteria growth at bay. Verdict: I find it slightly too gentle for my needs and would prefer something stronger. Previously reviewed in my Jan/Feb2015 empties… This is my third bottle and I’m currently on my fourth, enough said. Verdict: What do you think?! This is quite an exclusive Japanese skincare to be found in Singapore. Currently, the only place I know that’s carrying the brand is Face Bistro at Holland V. Basically these are essence that are targeted at our individual’s skin problem.. mine is obviously dehydrating and in need of some brightening! It’s very straightforward to use, absorbs easily like water and is ideal for using twice a day. I like that despite the thick consistency, the products are very lightweight with no greasy afterfeel. Verdict: I would repurchase this as it helps keep my face hydrated, and its easy to mix around with other products. Recommended by Celia from Bloc+, this is perfect for girls with ash-colored hair. I was using O&M’s Conquer Blonde Silver Shampoo previously and felt that it couldn’t keep the crazy yellow at bay. With MUK, my ash color lasts much longer – to the point that even Celia was surprised that my hair was still ashy few months later. It’s suitable for daily use and doesn’t dry out my bleached hair, yet at the same time, it is still good enough to keep my oily scalp at bay. This was introduced by the #1 Kiehl’s fan in the family.. my dad! I was complaining how flat and limp my hair was previously so he asked me to try it out. And yes, I do rotate my shampoo on a regular basis; but will use my MUK Shampoo religiously for at least a week after coloring my ashy hair before rotating. This, I find, is much more drying than MUK so it obviously does a better job in making my hair looks fuller – just like how the product promises to. However do note that it may get a bit too drying (esp if your hair is bleached) so you can’t skip your conditioner whenever you’re using it. Verdict: I’m still trying other thickening shampoo before I decide on repurchasing, but I do reckon this is worth a try if you’re looking around for one. I bought this when I was in Japan because my skin was feeling so taut and Kose is so cheap in Japan!! Basically it does what every mist promises to deliver: keep your skin hydrated. The nozzle is super awesome as it targets on a much wider surface area when sprayed, making it very convenient and fuss-free for me. The scent may be overwhelming to some though, and it is one that I could never quite get used to. This was my holy grail after my HKG trip when my legs were so dry, patchy and had loads of dark spots. I don’t think I need to rave more if you’ve read my review previously since pictures speak a thousand words (read them here). I think some may find it cumbersome due to its oil texture and I would rather apply it at night when I have the luxury of time… but if you’re looking for an awesome product to moisturize your extremely dry skin, this is definitely worth a try. I’ve always feel that Creme Simon does know gets the recognition it deserves. Having been using their products for almost a year and loving how they actually works on my skin and helps minimise oil production, one of their product I have recently finished sing is none other than their toner mist. Yup, you can use it as a toner or as a mist, and it absorbs super quickly into one’s skin. A tip I’ve learnt from Larry Yeo is to leave Creme Simon’s hydrating mask for 5 minutes before removing it with the toner mist and your face will be all prep for longer lasting makeup. Tried and tested! Next Post Feel invigorated with Original Source!